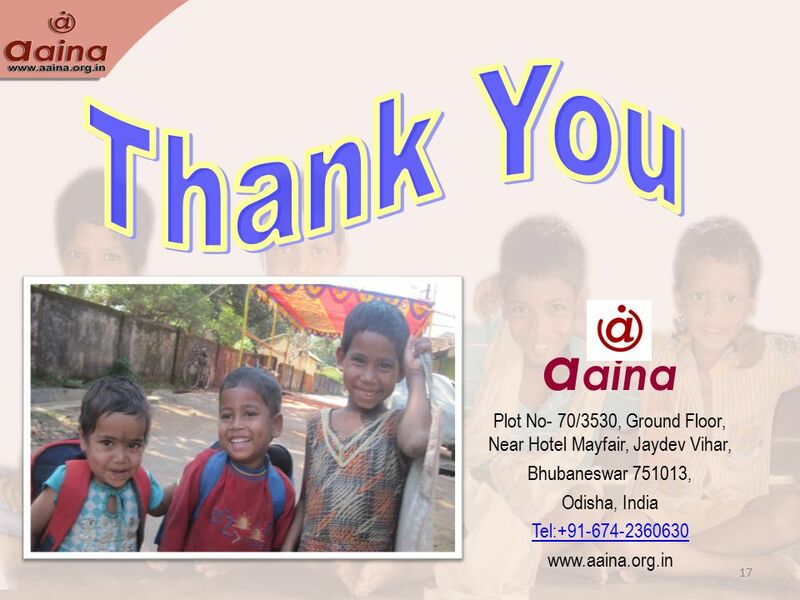 Join Hands for Child rights: Ending Violence Against Children Sneha Mishra Secretary, a aina Sneha Mishra Secretary, a aina. 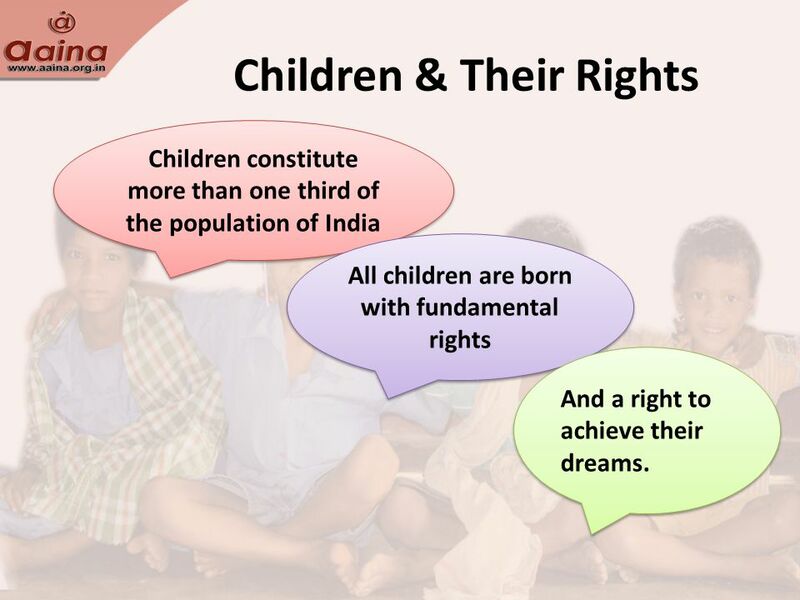 2 Children & Their Rights Children constitute more than one third of the population of India All children are born with fundamental rights And a right to achieve their dreams. 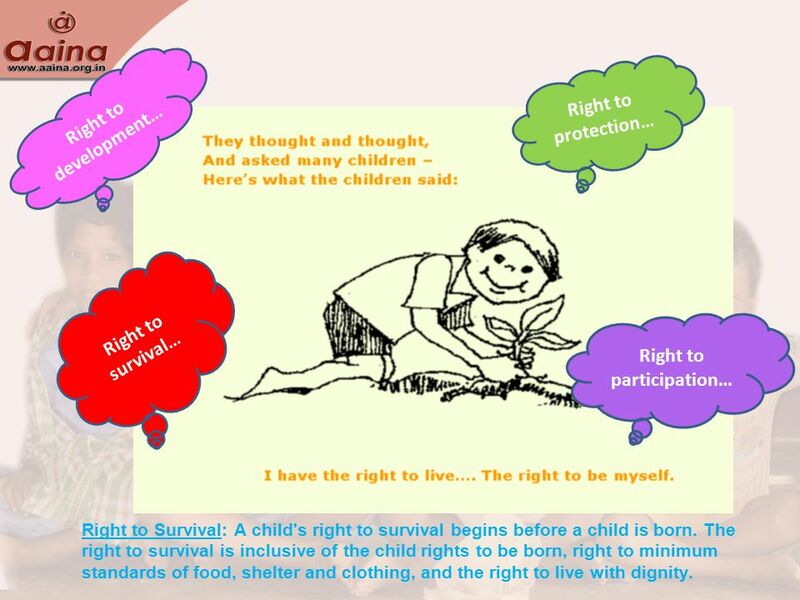 3 What are Child Rights? 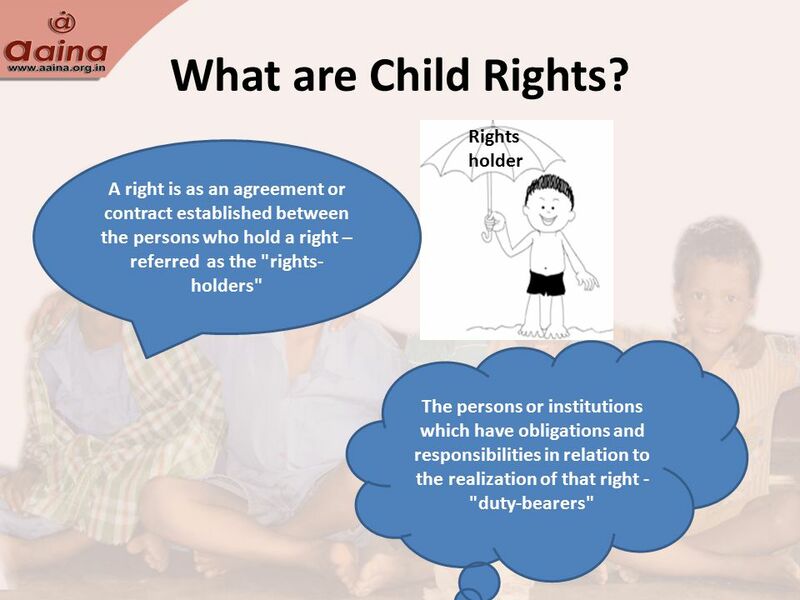 Rights holder A right is as an agreement or contract established between the persons who hold a right – referred as the "rights- holders" The persons or institutions which have obligations and responsibilities in relation to the realization of that right - "duty-bearers"
4 Child rights are specialized human rights that apply to all human beings below the age of 18. 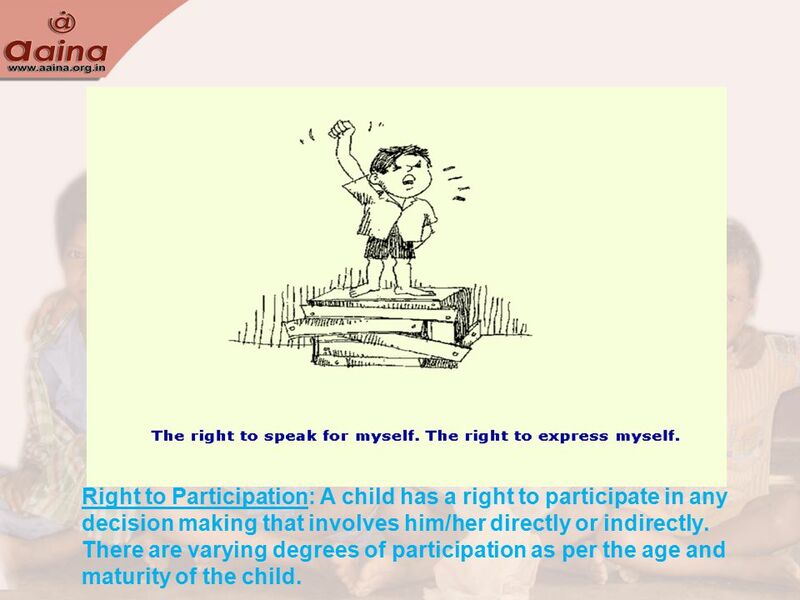 7 Right to Participation: A child has a right to participate in any decision making that involves him/her directly or indirectly. There are varying degrees of participation as per the age and maturity of the child. 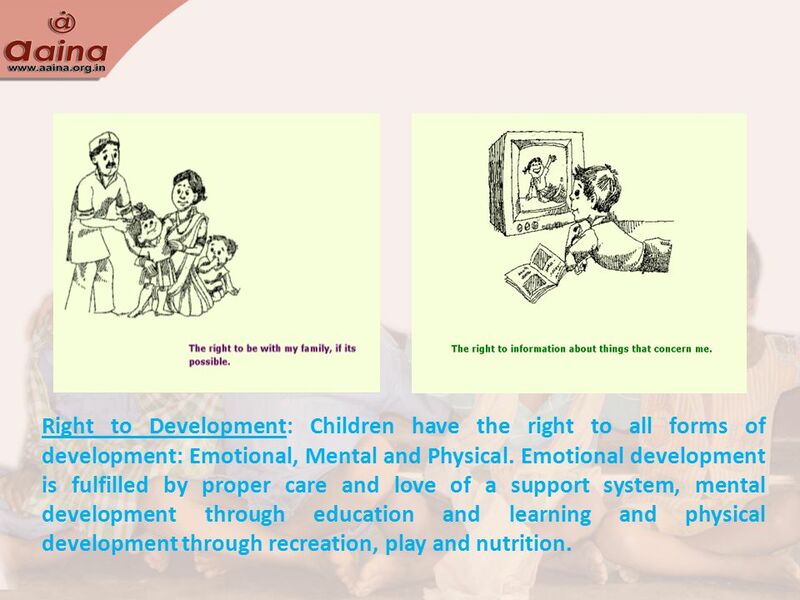 8 Right to Development: Children have the right to all forms of development: Emotional, Mental and Physical. 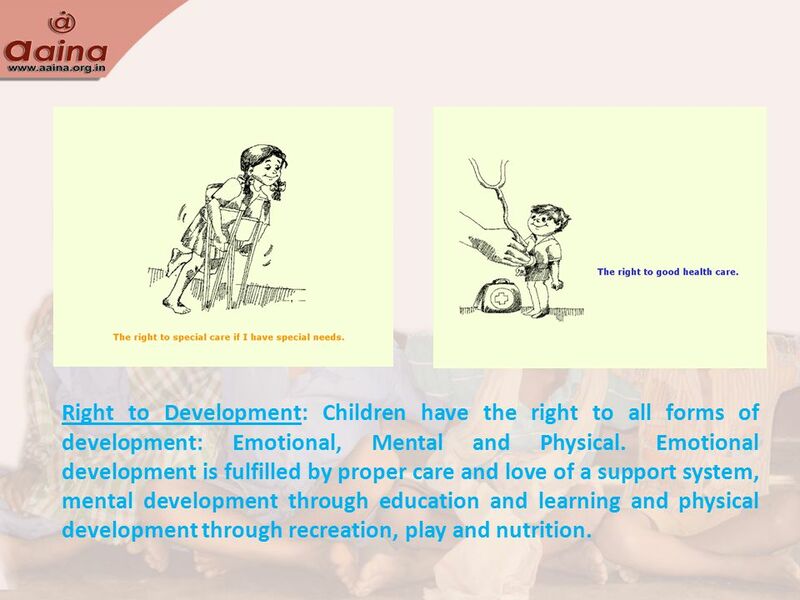 Emotional development is fulfilled by proper care and love of a support system, mental development through education and learning and physical development through recreation, play and nutrition. 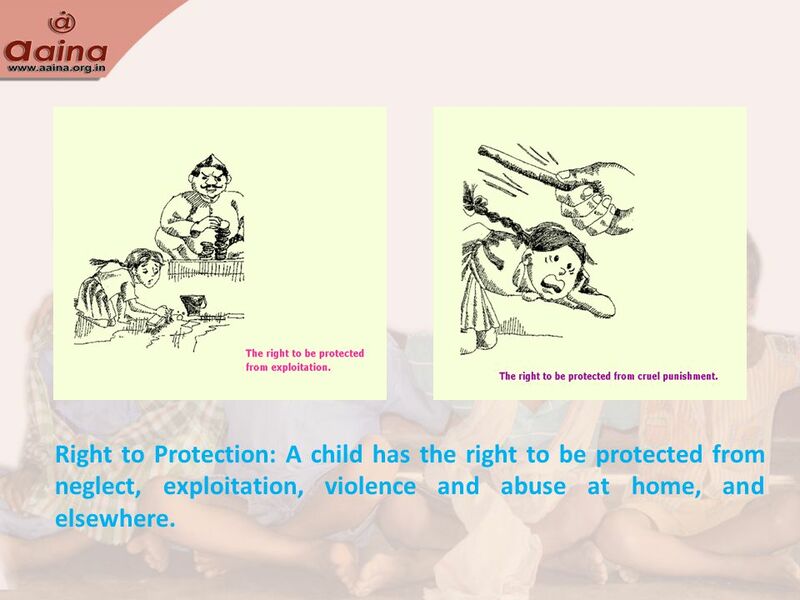 10 Right to Protection: A child has the right to be protected from neglect, exploitation, violence and abuse at home, and elsewhere. 11 The UN finds these rights interdependent and indivisible, meaning that a right cannot be fulfilled at the expense of another right. 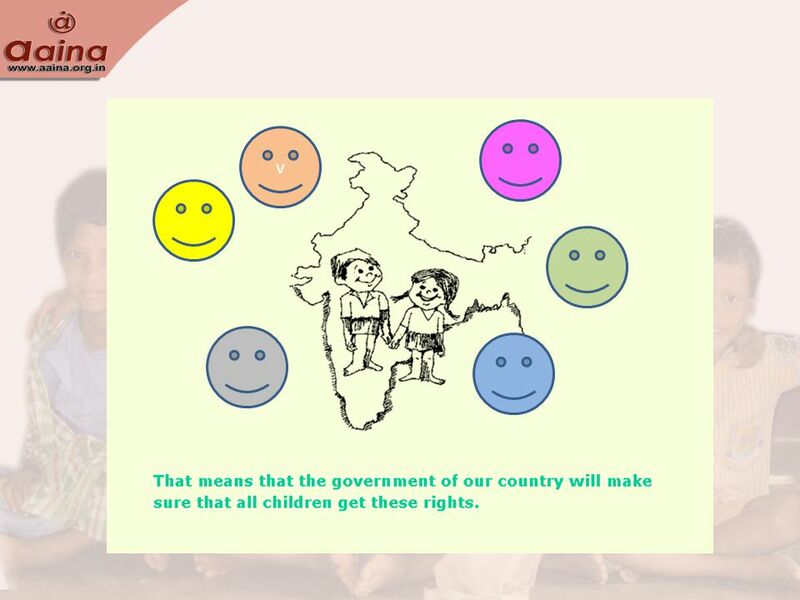 12 Many countries signed the paper and agreed to ensure that their children got these rights. The govt of India too ratified this document on 1992. 15 Every day, in every country, girls and boys suffer and witness violence. 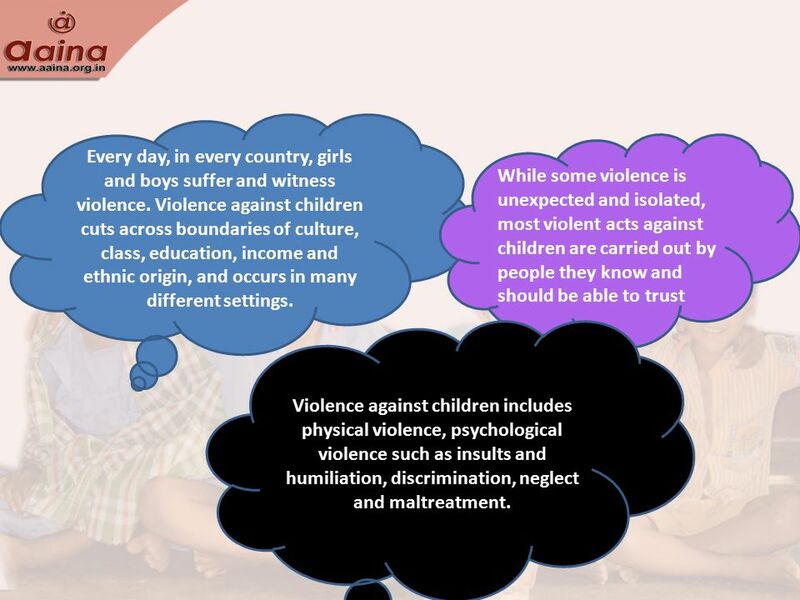 Violence against children cuts across boundaries of culture, class, education, income and ethnic origin, and occurs in many different settings. While some violence is unexpected and isolated, most violent acts against children are carried out by people they know and should be able to trust Violence against children includes physical violence, psychological violence such as insults and humiliation, discrimination, neglect and maltreatment. 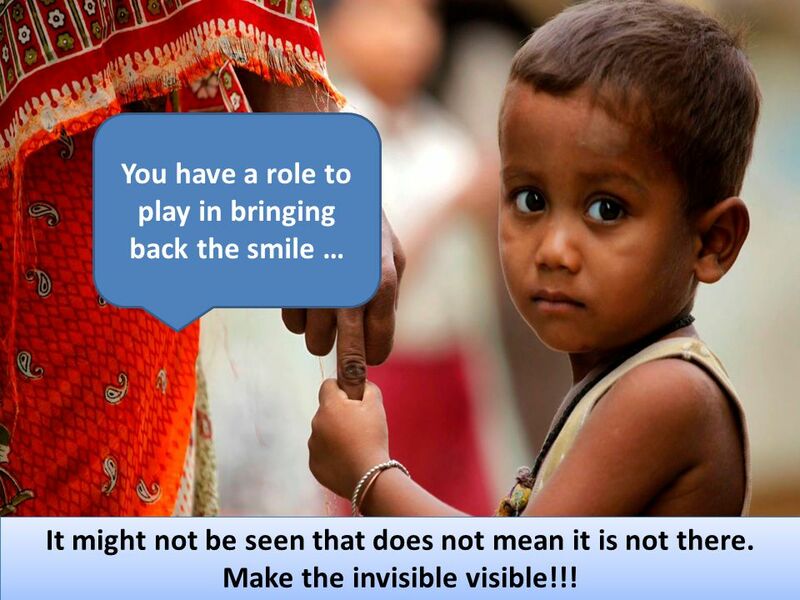 16 You have a role to play in bringing back the smile … It might not be seen that does not mean it is not there. Make the invisible visible!!! It might not be seen that does not mean it is not there. Make the invisible visible!!! 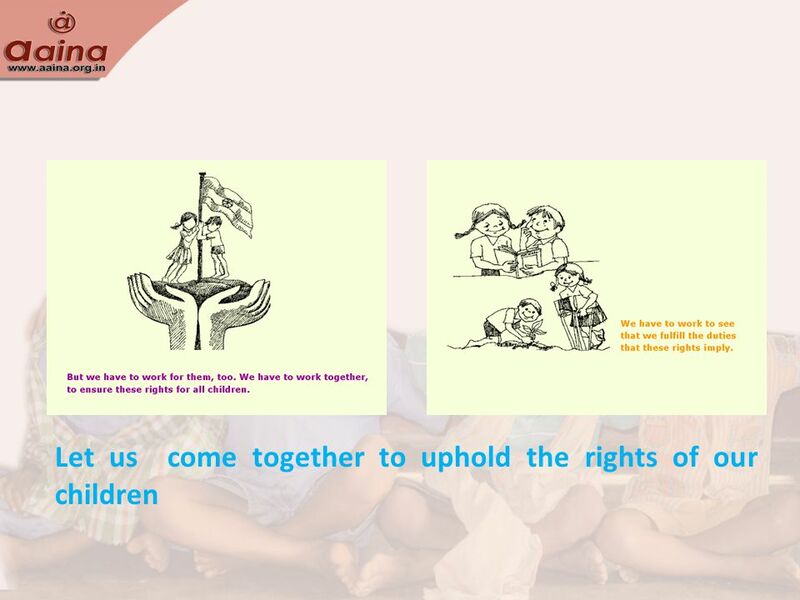 Download ppt "Join Hands for Child rights: Ending Violence Against Children Sneha Mishra Secretary, a aina Sneha Mishra Secretary, a aina." 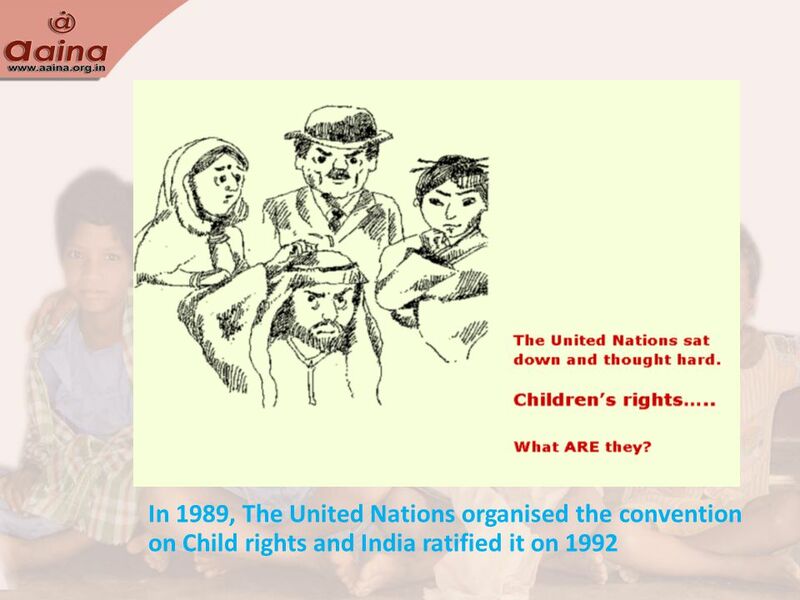 A Brief Guide to the United Nations Convention on the Rights of the Child About UNICEF. UNICEF was set up in 1946 as a response to the crisis in post war. Shikha Wadhwa UNICEF, Jaipur. 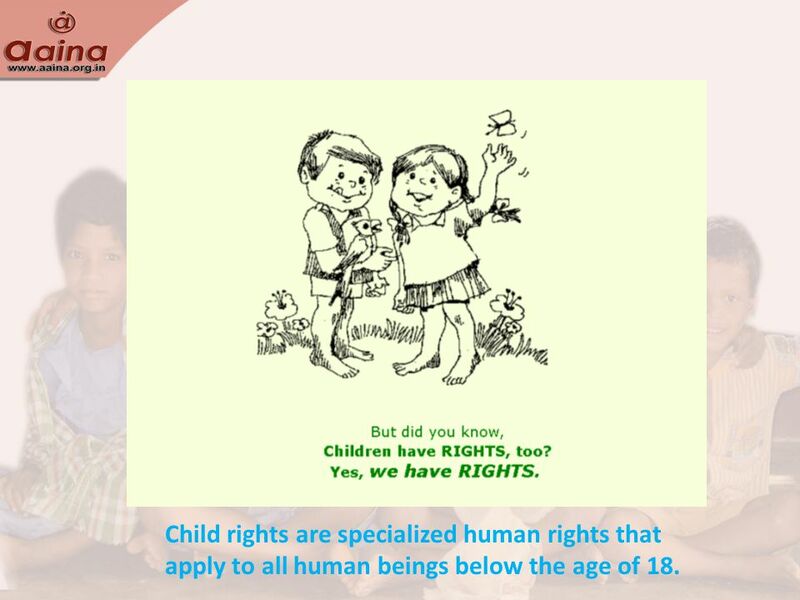 UN Convention on Rights of the Child Has changed the way we work with children Child - up to 18 years Convention. Chapter 14 Family Life Today. Chapter 14 Family Life Today. 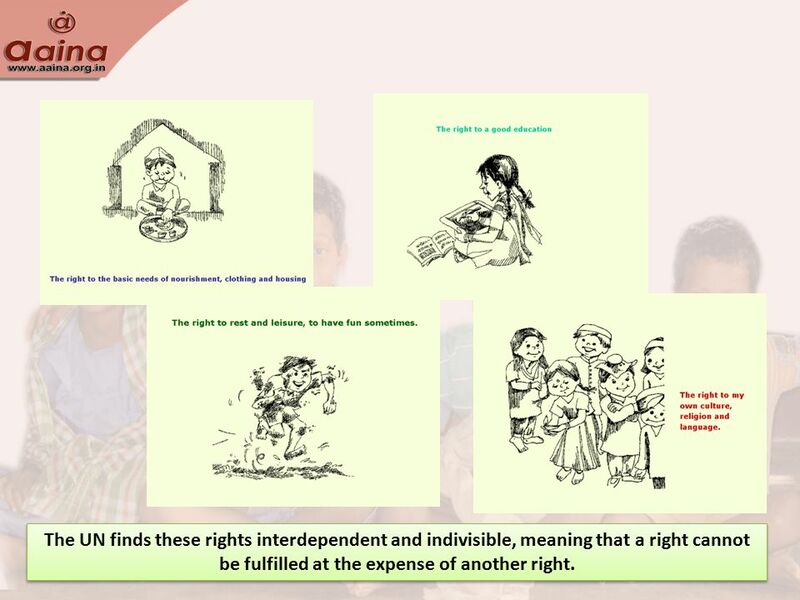 An introduction to children’s rights. Group activity. International Human Rights Law. Where, after all, do universal human rights begin? In small places, close to home—so close and so small that they cannot. ABUSE Abuse is maltreatment as a single or repeated act, or neglect; it may be intentional or owing to ignorance or thoughtlessness, by a person or persons. Investing in Child Protection By Beatrice Ogutu Regional Advisor, Child Protection ICS Africa Dec 7 th and 8 th -2010ICS : 4 th International policy conference.